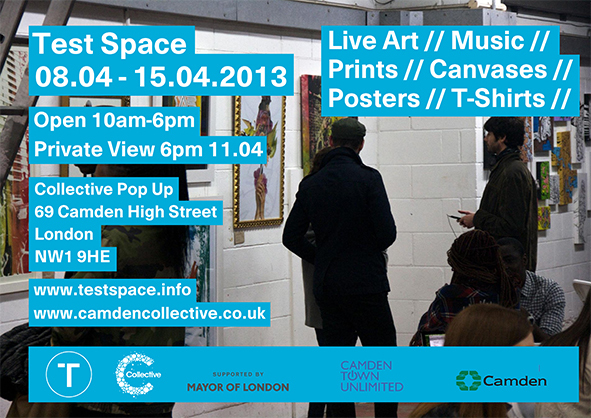 Test Space and Camden Collective are collaborating for the first time to use the new Collective Pop-up Space in Camden High Street, making use of a former high street store. Part of it will be an art store featuring limited edition screen prints, posters, canvases, skate decks and T-shirts from some up and coming artists. I love these imaginative uses of empty shops! 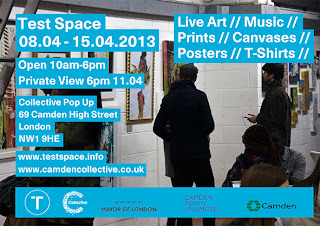 "Test Space will be taking over the brand new Collective Pop Up space; turning the refurbished high street shop into a week long temporary store, gallery and event space. There will be music, drinks and live screen printing to celebrate the first Collective occupier of 69 Camden High Street. Work for sale includes limited edition screen prints, posters, canvases, skate decks and t-shirts from Andrew Corlett, International Nobody, Hunto, SPZero76, Ferres, Pogger and many more. Test Space is a creative agency developing innovative and new ways to showcase artists and their work; making use of temporary, short term and abandoned property to do this."